"This book explores the development of ideas in psychology's past. It is the initial volume in a series intended to shape such ideas into a valuable resource for the discipline's future. Scientists, in general, are known to ignore their own history, considering it to be a graveyard of failures. 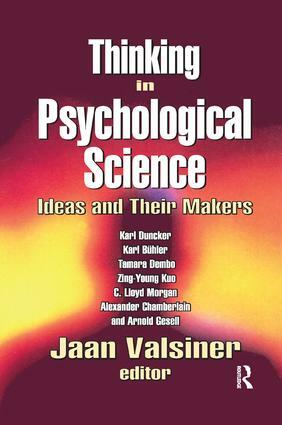 In Thinking in Psychological Science, selected ideas of key figures in the cognitive, comparative, and developmental sides of psychology��Karl Duncker, Karl Biihler, Tamara Dembo, Zing-Young Kuo, C. Lloyd Morgan, Alexander Chamberlain, and Arnold Gesell��are traced, and the social contexts of their ideas are given a collective analysis, focusing on the potential of these ideas for the present state of psychology.Representing the scientist as ""hero"" has become a necessary component when applying for research monies from governmentally controlled funding agencies. Yet the reality is just the opposite: Science is not just the product of ""heroes""; it is the product of many individuals who often search for solutions to basic problems throughout their lifetimes�� while only a few arrive at breakthroughs. Still, familiarity with the flow of thought in the efforts to solve the basic problems of humankind is necessary for any understanding of creativity. This book analyzes the processes involved in the search for solutions to major theoretical problems��of development (Kuo, Gesell), action and cognition (Biihler, Bunker, Dembo), and methodology (Morgan). Ultimately, this is an exciting volume that reveals real science in the making.Thinking in Psychological Science will be of interest to students of the social sciences and intellectual history. It is ideal for graduate and upper-level undergraduate courses in psychology, the sociology of science, and cognitive science."